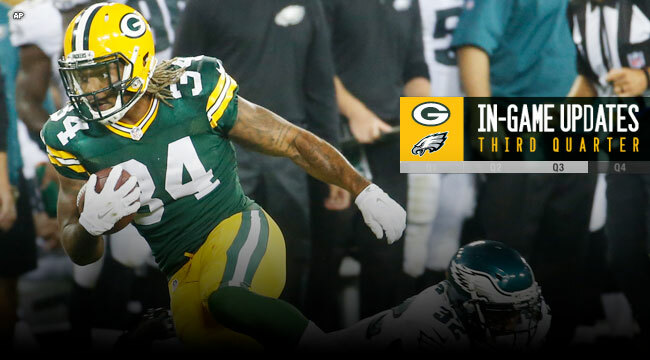 GREEN BAY — Rookie quarterback Brett Hundley had thrown for 315 yards after three quarters of play at Lambeau Field on Saturday night, but the Packers trailed the Eagles, 39-20. After having thrown a pick-six interception early in the game, Hundley settled down and began building an impressive night statistically. He completed 22 of 31 passes, including two touchdown passes and one interception. Hundley completed a 4-yard touchdown pass to rookie tight end Kennard Backman late in the third quarter, and was making a strong bid for a spot on the Packers’ 53-man roster.